Who is Kevin? What are his strengths, interests, and job preferences? One of the most important features of customized employment is discovering the gifts and talents of the job seeker. Individuals in the person’s life and the professionals who are supporting the person are encouraged to answer the questions: Who is this person? What are his or her gifts and talents? Through the discovery process, individuals are identified by their unique gifts and contributions and not as people with disabilities. Kevin, not his real name, graduated from high school and lived at home without a job or structured activity for about a year. When attending an appointment at the Children’s Hospital of Richmond at Virginia Commonwealth University (VCU), Kevin and his family were told about a research study that is assisting transition-age youth with physical disabilities to find customized jobs. They were interested in the opportunity, because Kevin reported that he was bored after leaving school without anything to do. After meeting with staff, Kevin and his family gave their consent for him to participate. The first step was to identify Kevin’s interests and learn more about him as a person. Kevin and his employment specialist completed a number of activities in the community to learn about his preferences. It was immediately apparent that he has an excellent sense of humor, is very social, and enjoys being around people. The employment specialist also learned that Kevin is very knowledgeable of movie trivia, which he enjoys discussing with others. Kevin independently uses his power chair for mobility, is very interested in talking with others, and really wants to work! Some of Kevin’s barriers to employment included that he uses a power wheelchair, has limited use of his left hand, and is sometimes difficult to understand by people who do not know him. Focusing on these challenges had made it difficult for some professionals to view him as a person who has much to offer a business! Customized employment was just the service that he needed to find a job that met his unique needs while also providing a valued service to an employer! During the discovery process, Kevin’s employment specialist got to know him and learned about his interests. 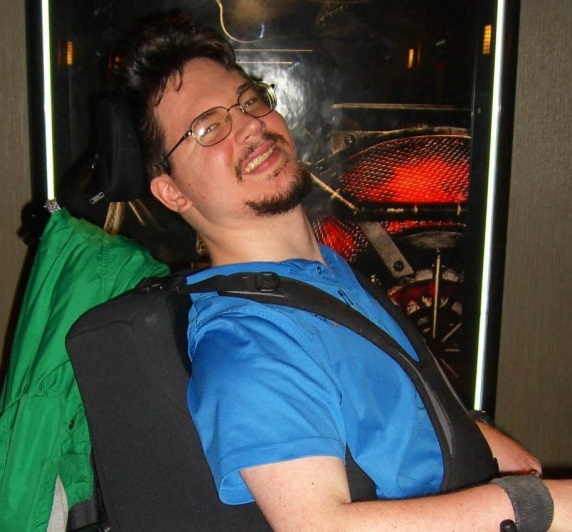 Kevin shared that he enjoyed helping people and some of his interests included movies and television shows. 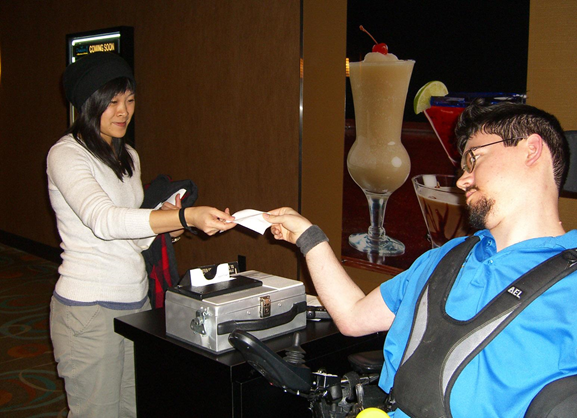 Kevin’s employment specialist worked with a movie theater to customize a ticket taking position for him. Typically, theaters schedule ticket-takers on a rotating basis, usually on Friday and weekends. However, the employment specialist, in working with the theater manager, learned that there was an unmet need for an evening ticket taker during the week. She negotiated a position with a consistent schedule to accommodate Kevin’s reliance on personal care assistance. The theater hired Kevin as a ticket taker to work Monday through Thursday from 5:30 pm to 9:30 pm at $7.50 per hour; the same rate as other ticket takers at the movie theater. In addition, the theater management removed some tasks from his job description usually assigned to ticket takers such as cleaning the theaters, which resulted in a customized job for Kevin. What are some of Kevin’s unique support needs? Kevin lives in his own home with 24-hour personal care assistance funded by the Virginia Birth-Related Neurological Injury Compensation Program. An aide is with him at all times providing personal care and transportation. Early in his job search, it was determined that his aide could transport him to work and provide personal care assistance on the job as needed. 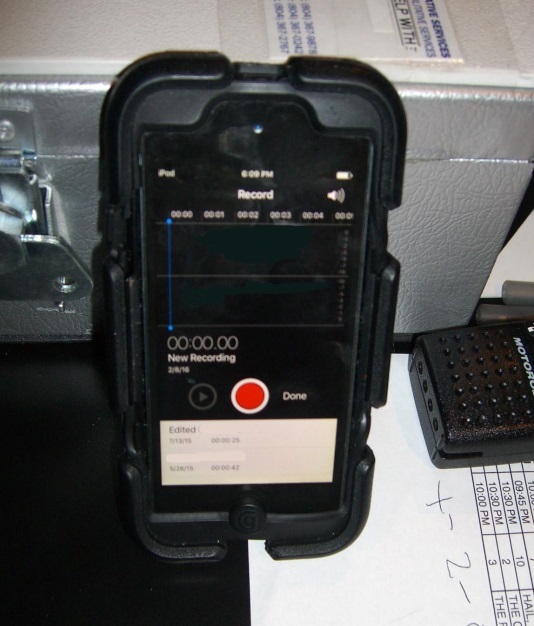 All employees must store their cell phones or other devices such as an iPod during their shifts as mandated by theater policy. An accommodation was made for Kevin allowing him to keep his cell phone and iPod with him while working. 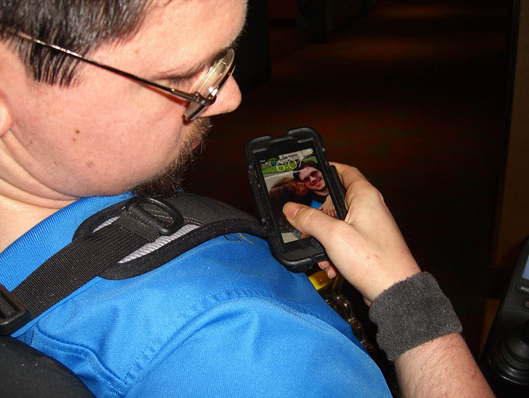 Kevin uses his phone to call or text his aide when he needs personal care assistance. She stays within the general area of his job to assist him when needed. In addition, employees only can have drinks or snacks in the kitchen or dining area during breaks. Since Kevin quickly becomes dehydrated, the employer agreed that he could keep a bottle of water with him during work. Theater employees have a thirty-minute break during their shift. Instead, Kevin has two fifteen minute breaks, which helps him sustain his stamina. Two breaks instead of one meets his personal care needs at work. In addition, the employer extended an employee benefit to Kevin’s aide. She can watch movies free of charge during off peak hours while supporting Kevin in his job. What other accommodations does Kevin have at work? 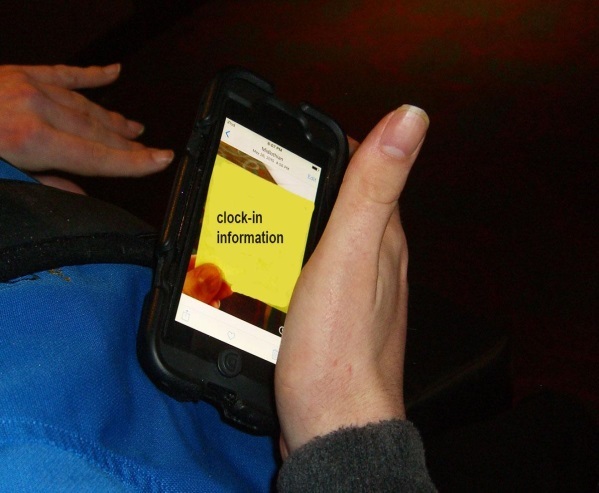 All employees are required to clock in at the ticket box or behind the bar. Neither of the areas are accessible, and Kevin needed a way to clock in and out. The solution is for Kevin to keep a picture of his employee ID and log in information on his iPod. When he arrives at work, Kevin shows this picture to a coworker either behind the ticket box or the bar, and the coworker clocks him in. Kevin repeats this process when clocking out at the end of his shift. Kevin was not able to tear movie tickets, and he needed some way to do this job duty. Initially he tested a “ticket cutter box” made by a rehabilitation engineer at the Virginia Department for Aging and Rehabilitative Services (VA DARS). The box had a blade attached to a sensor that cuts the tickets in half when inserted. Due to a number of design concerns and Kevin’s individual needs, the rehabilitation engineer made modifications. 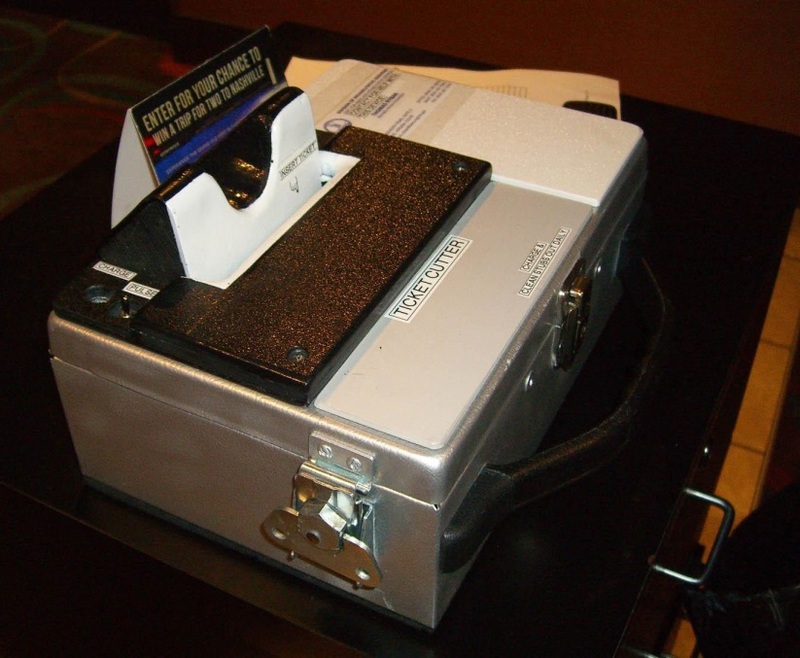 The resulting ticket cutter is shown in the photo. 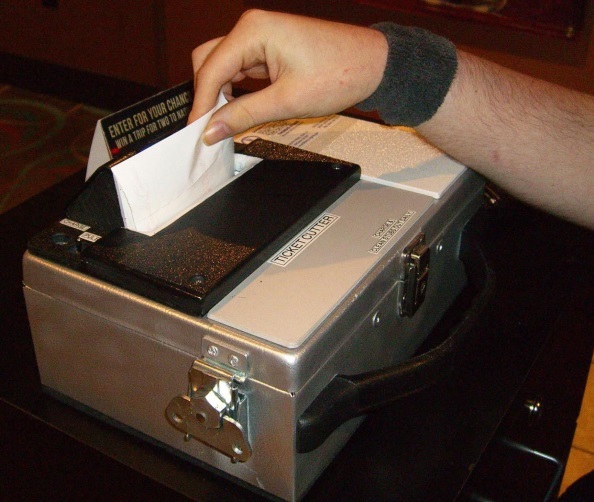 The ticket cutter allows Kevin to cut movie tickets so that the half maintained by the theater falls into the empty chamber of the box. Kevin returns the receipt half to the customer, since assigned seating is printed on the ticket. During job site training, Kevin’s employment specialist taught him how to correctly hold and insert the ticket so this important information is returned to the customers. The theater is unique in that it serves meals and drinks to the patrons during the movies. Ticket takers are responsible for informing patrons new to the theater on how to get an ID wristband for ordering alcoholic beverages and food while in the theater. Because Kevin is sometimes difficult to understand, he needed some strategy to explain the information to moviegoers. Kevin’s employment specialist recorded a male manager reciting the greeting that included instructions on ordering. Kevin learned to ask patrons if they had been to the theater before. If they answer, yes, his response is “welcome back.” If they answer no, he plays the recorded message on his iPod. Management prints a daily sheet each day for the theater staff. These sheets include pertinent information such as theater numbers and the start and end times for each film. The employment specialist talked with management to change the format of the sheets for Kevin, since he does not need all the information on the standard sheets. Eliminated information allowed for the page to be printed in a larger font, which Kevin needed. 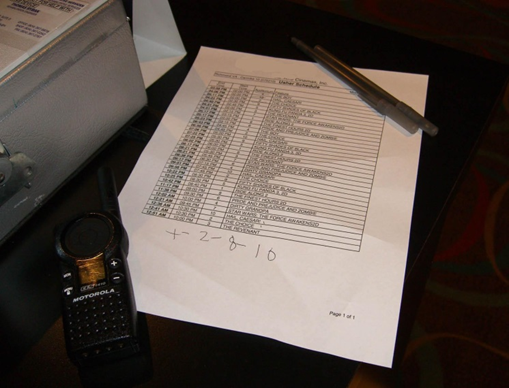 This simple accommodation made it easy for him to keep track of the theater numbers and times for each showing. The Birth-Injury Program helps parents take care of children that are born with serious birth-related neurological injuries. The Program covers what insurance and other programs do not: medically necessary expenses such as medical expenses, hospital expenses, rehabilitation expenses, in-home nursing care and much more. Learn more about this innovative program. We would like to thank the management and staff of the movie theater for their continued support and assistance. Kevin has been employed at the theater since May 2015 and is a valued and satisfied employee. The project staff members who have assisted him in finding this customized position and maintaining his employment are Ms. Stephanie Lau, Ms. Rachael Rounds, and Mr. Tomoya Lamberson. We would also like to acknowledge the support of the Virginia Department for Aging and Rehabilitative Services (VA DARS) and the rehabilitation engineer, Tom Rybak, who assisted in the design and fabrication of Kevin’s ticket cutter. The authors of this case study are Dr. Katherine Inge and Ms. Stephanie Lau at Virginia Commonwealth University’s Rehabilitation Research and Training Center on Employment of People with Physical Disabilities. If you have questions on this fact sheet and on the VCU-RRTC, you may contact Dr. Inge, Project Director at [kinge@vcu.edu] or (804) 828-5956. For more information on the VCU-RRTC, please visit http://www.vcurrtc.org. VCU-RRTC is an equal opportunity/affirmative action institution providing access to education and employment without regard to age, race, color, national origin, gender, religion, sexual orientation, veteran's status, political affiliation, or disability. The VCU-RRTC is funded by the National Institute on Disability, Independent Living, and Rehabilitation Research (NIDILRR grant number #90RT503502). NIDILRR is a Center within the Administration for Community Living (ACL), Department of Health and Human Services (HHS). However, these contents do not necessarily represent the policy of NIDILRR, and you should not assume endorsement by the Federal Government.